Project Sites are created using the correct site template that is associated to the EPT. Test this on a test / dev farm before running a live production farm. The answer to this question in my opinion is no. In this blog post I will explain why using an example. Firstly I have created a new test duration field on my test Project Server 2013 environment, this is called _duration. 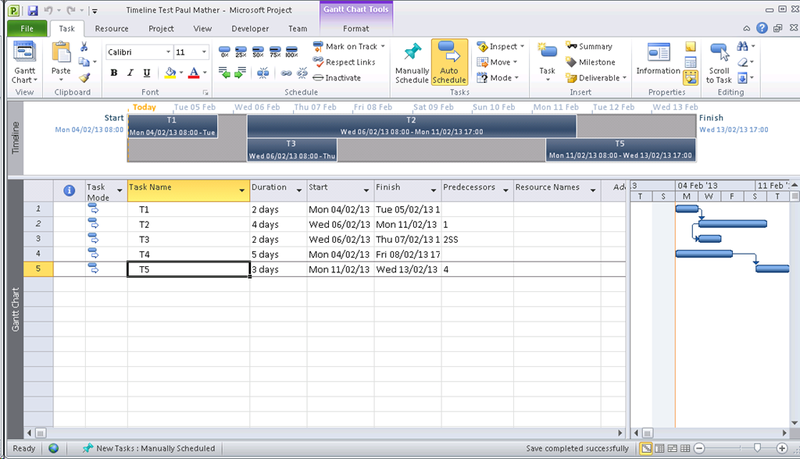 Notice the _duration field correctly shows the 10 days. Reset this back to 10 days then save and publish the project again. 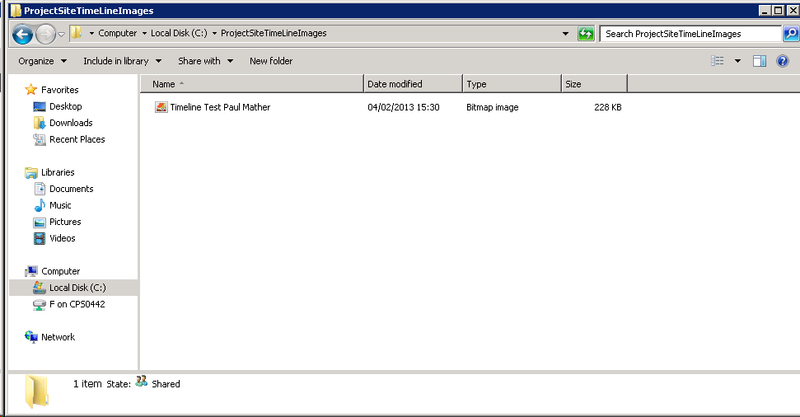 I was aware of this issue in Project Server 2010 but only just came across the same thing in Project Server 2013. Update the http://vm753/pwa part of the URL for your PWA URL. A walkthrough using the script is below. 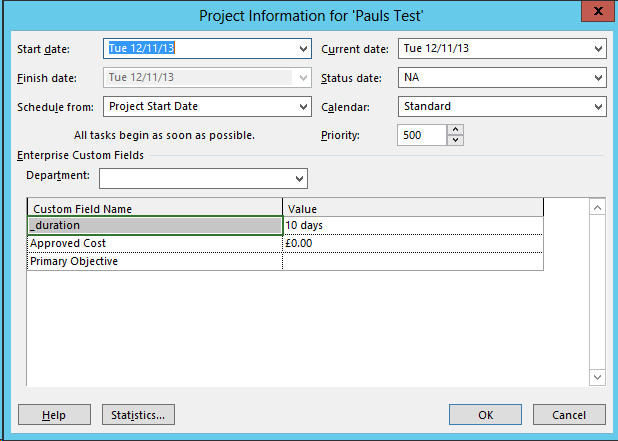 The new Project will be called “CPS Test Project by Paul Mather”, it will use the “PMTemp1” template and then associate the new project to the “PM TEST” EPT. 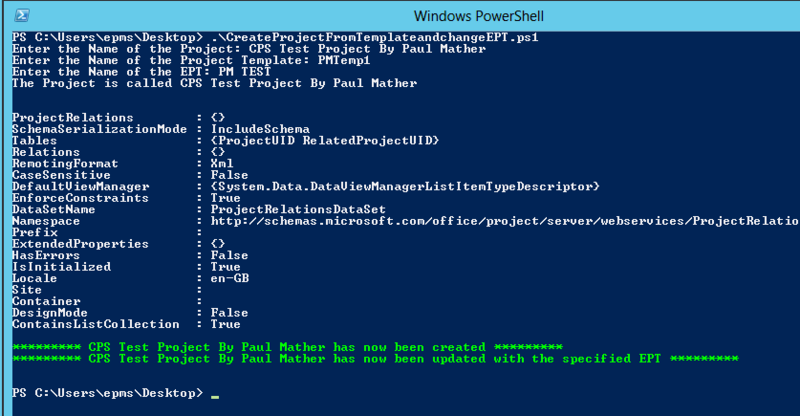 When using the CreateProjectFromTemplate method only, this new project would have been associated to the Enterprise Project EPT as this is the default EPT. This is just an example of what can be done, many improvements could be made, certainly around error handling but it provides a working example for you to build on. A quick blog post to highlight an issue and workaround for editing plans in PWA when using custom fields that use the inbuilt fields. This post uses Finish Variance as an example. The Finish Variance field doesn’t recalculate in PWA after making edits to plans, this only updates after changes in Project Pro. This post relates to the Finish Variance field but other fields will more than likely have the same issue. As you can see the Finish Variance and the Task Finish Variance values are currently the same and so are the 2 RAG fields. Edit the plan in PWA and increase the task durations, for this example double the durations. 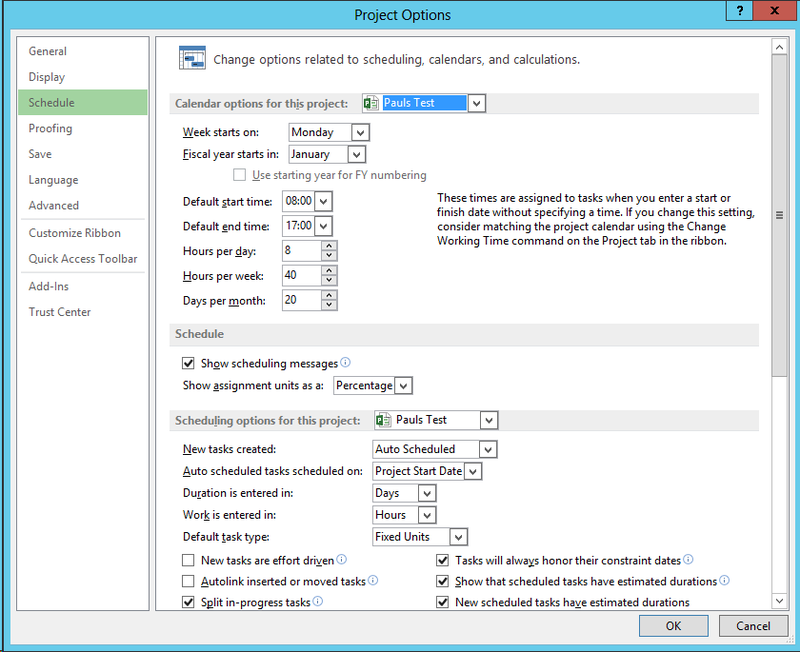 Calculate the plan then save and publish the project. Refresh the page and you will see that the Finish Variance is incorrectly 0, the Finish Variance RAG is still green as this uses the Finish Variance field. The good news is that the custom field that calculates finish variance (Task Finish Variance) shows the correct values and the Finish Variance (Calc) RAG also shows the correct RAG. To get the RAGs to calculate correctly when editing in PWA you might need to create your own custom fields to replicate the calculations used on inbuilt fields. 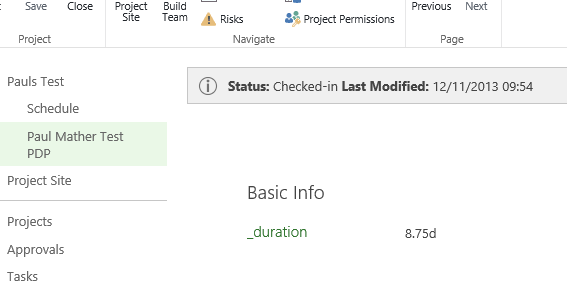 Obviously it would not be recommended to create too many task level calculated fields due to performance issues but hopefully that little workaround helps for key RAGs. Also worth noting, install the March 2013 Public update: http://support.microsoft.com/kb/2768001 if installing the June 2013 CU. 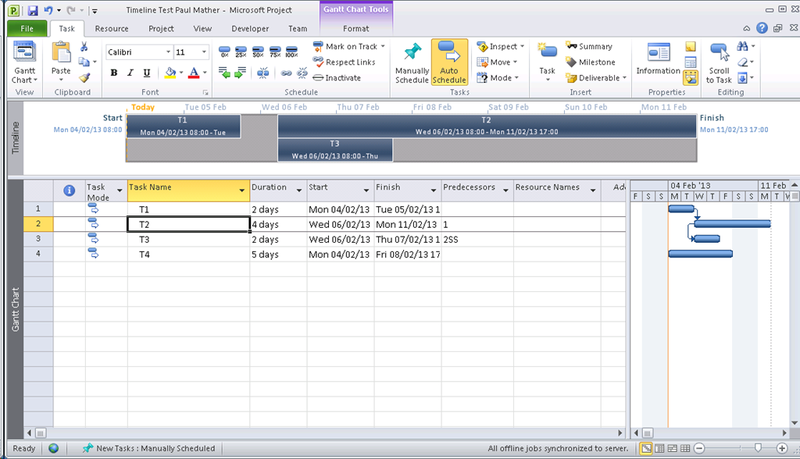 Remember SP1 is a pre-requisite for the Office 2010 June 2013 CUs. With this tag in place the HP ProtectTools ignored that fact that the password was plain text and the unattended account was set successfully. This workaround only works when setting the unattended account using the example PowerShell script above. It doesn’t work in the UI. 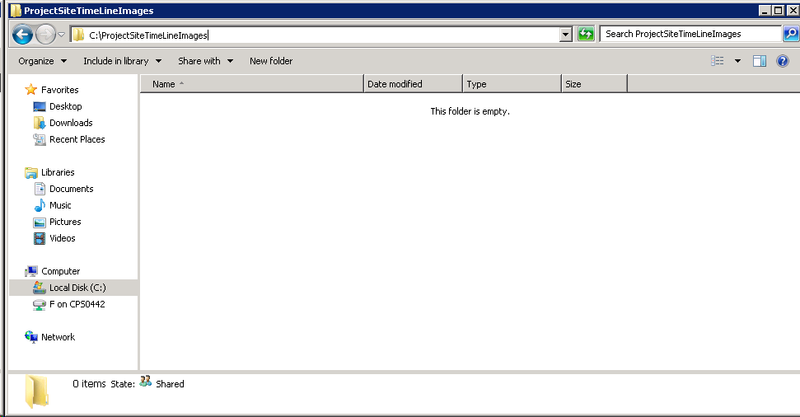 Microsoft.ReportingServices.Diagnostics.Utilities.SharePointException: , Microsoft.ReportingServices.Diagnostics.Utilities.SharePointException: Report Server has encountered a SharePoint error. —> System.NullReferenceException: Object reference not set to an instance of an object. The cause of this error was that the user who created the SSRS objects had been removed from SharePoint when the system was cleaned up to take on to the clients environment. 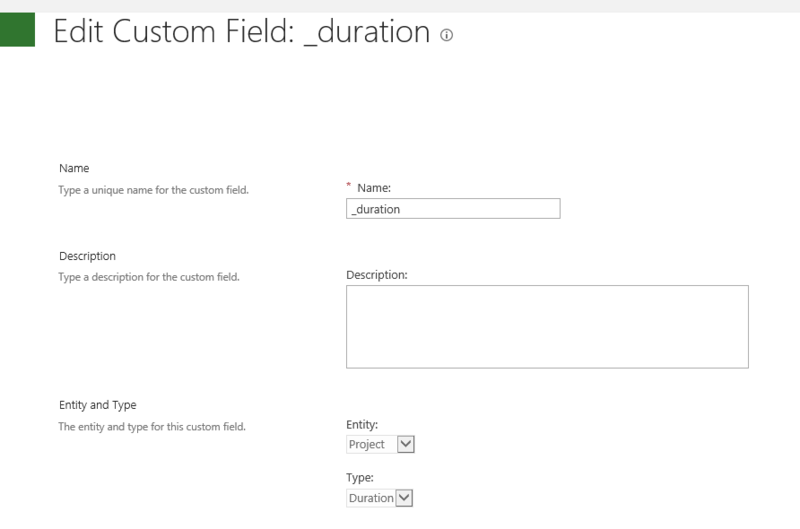 There is a simple fix, that is to update the Author (Created By) and Editor (Modified By) fields with a user that exists on the SharePoint farm. The Author field can’t be updated via the UI but it can be update via the object model. $newuser = "support\paulmather" This needs to be updated with the new author and editor’s user account. $site = get-SPWeb http://vm353/pwa/ProjectBICenter This needs to be updated with the correct URL for the site that contains the list / library. $list = $site.Lists["Test"] This needs to be updated with the name of the correct library / lists that contains the list items that need to be updated, in this example the SSRS items. That is it, the script is then ready to run. Please fully test on a replica test farm before running on Production. Now that the first CU’s for 2013 are available, I will include both 2010 and 2013 updates in the future posts. 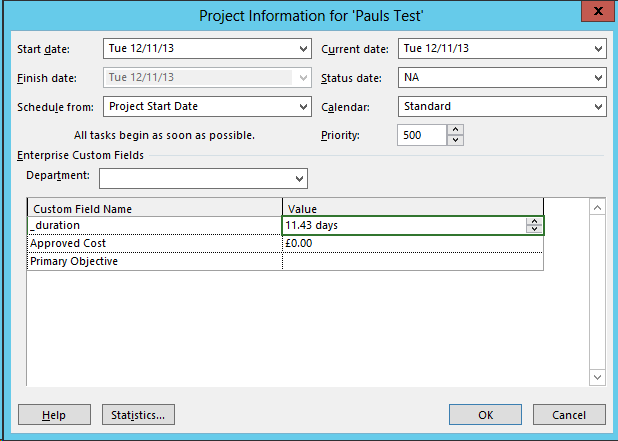 Remember SP1 is a pre-requisite for the Office 2010 February 2013 CUs. One question we have from many clients is, can we have the project timeline image on the project site. The answer is yes, but this will not update automatically in Project Server 2010. 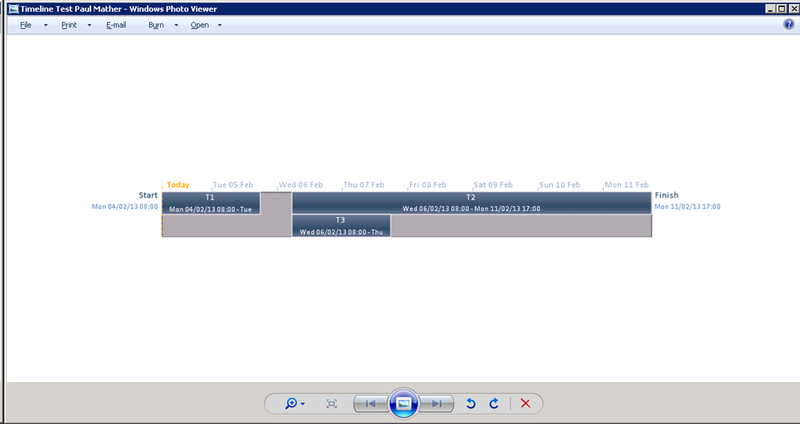 On a side note, it is possible to have the timeline view in Project Server 2013 PWA! For this to work a custom DLL is required on the workstations as there is no option to save a clipboard image to a file in VBA (as far as I know!). The DLL can be downloaded here: http://www.vbforums.com/showthread.php?585616-clipboard-activex-for-vba-vbs-etc Use this at your own risk as I do not know the code behind this DLL! For this example, I created a file share to store my images \\vm353\ProjectSiteTimeLineImages. All users will need read / write access to this share. Notice only 3 tasks are added to the timeline, lets add some additional tasks. As mentioned, the VBA could be improved with error handling etc. Use this and the custom DLL at your own risk and fully test on a test workstation and PWA instance first.